It is Valentine’s Day and everyone and everything seems to be abuzz with how to celebrate a day devoted to love and affection with Mr. X or Mr. Z. My facebook wall suggests I spend it getting to know my adopted city a little better. After all, I love it, don’t I? The offered walk is through Lal Baug on Sunday morning, 14 February, 8:30 am. I know nothing about the precinct mentioned in the marketing pitch. 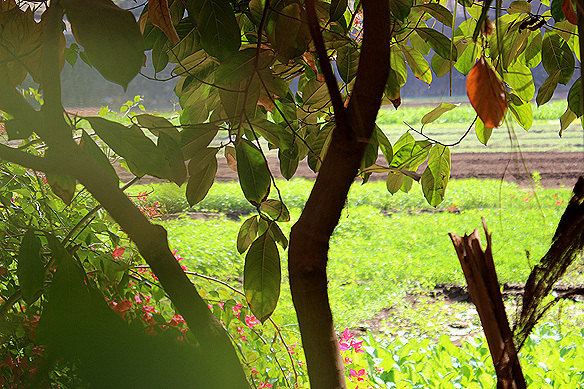 The name Lal Baug translates to red garden. Red for love. 🙂 Curious, I click on ‘going’. Lal Baug, I soon discover is not one story but a tapestry of many, weaving into each other, much like a person if I may say so. It is more than a geographical area. It is a context, a community. Bombay or Mumbai or vice versa would be incomplete without Lal Baug. Let me explain. 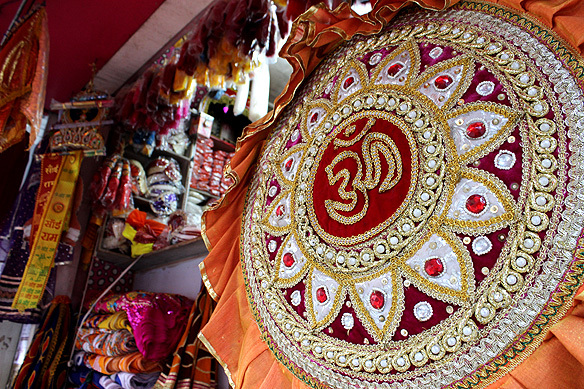 The neighbourhood between Dadar and Parel in Central Mumbai is best known to the city for its Lalbaugcha Raja during Ganesh Chaturthi celebrations. Behind this obvious role is a story of Mumbai’s leading Parsee business families who called it home, a tale of textile mills built and dissolved, and of dargahs, fire temples and Hindu shrines juxtaposed. Fascinating, to say the least! Come, let me take you on my walk through the Red Garden. The cotton mills of Girangaon [village of mills] comprising Byculla, Lal Baug, Parel and Worli were the pioneers in the transformation of Bombay into the industrial metropolis it is today. 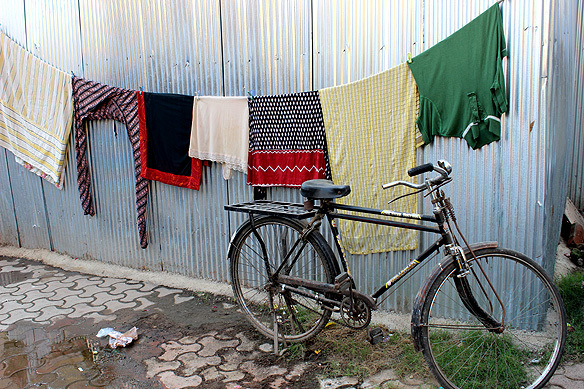 It all started in 1856 when The Bombay Spinning and Weaving Company was set up in Tardeo. By 1865 there were 10 cotton mills employing over 6,500 workers; by 1900, 136 mills, and in 1980, 300,000 were working in the 600 acre area. 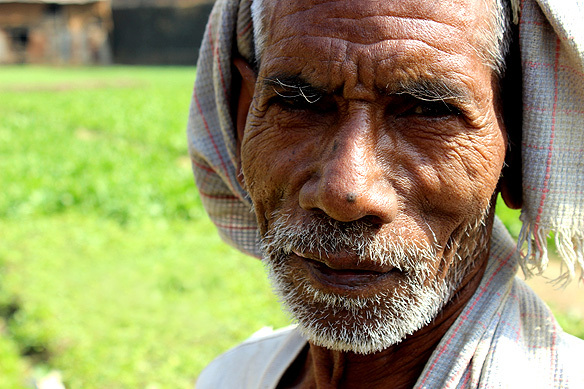 Male laborers, as young as 16, worked 10 hour shifts and lived in the surrounding chawls built by mill owners and government, often sharing their rooms with six or more others. There was inadequate ventilation and sanitation. Disease was rife with not much distinction between home and street. The chawls were inevitably the breeding grounds for gangsters, prostitution and the birth of the urban theatre or tamasha. These live on today as prime themes in Bollywood movies and in real life in its rampant underworld. The downfall of the mills began with the American Civil War and Britain’s move to Egypt for its cotton supply. The failure to update technology after World War I, the rapid growth of power looms, and the strike led by Dr. Datta Samant brought the industry down to its knees in the 1970s—post strike on 2 August, 1983, more than 100,000 workers were never rehired. Well aware of the prime position occupied by these defunct mills and its potential to yield billions in real estate, builders have slowly and surely been razing them to the ground, to replace them with fancy malls and steel and glass apartment blocks like One Avighna Park and Kalpataru Habitat. The encroachment into the community, compensating the locals with lower floors and separate entrances whilst selling dreams to the rich is an ongoing battle. The residents get a bigger apartment. The builder makes billions. And a 150-year-old way of life dies a daily death. This is, however, but one story. Let’s go on to the next, about Bombay’s richest families who have one thing in common. 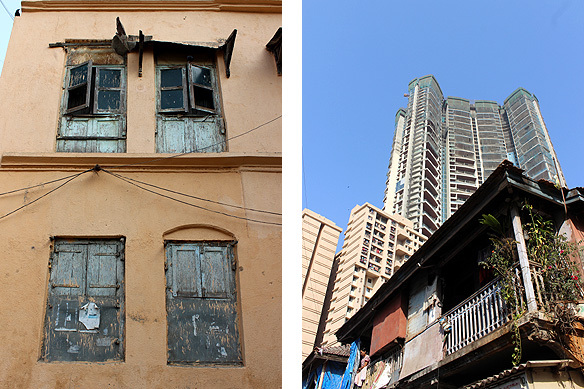 They built their fortunes in Lal Baug. Most of the mills in Girangaon were owned by former traders: the Tatas, Petits, Wadias [Parsee]; Currimbhoys [Muslim]; Sassoons [Iraqi Jews]; Thakerseys, Khataus, Goculdas [Hindu]; and Cottons and Greaves [English]. 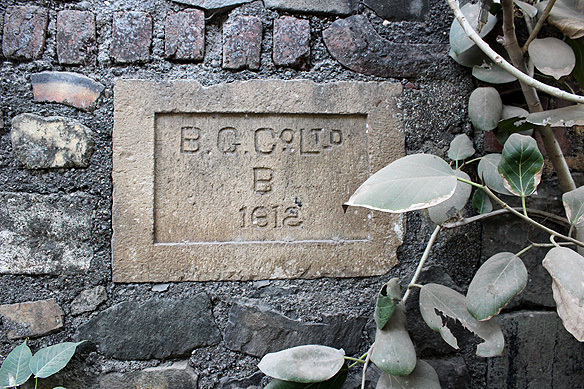 Lal Baug is also where the Godrej soaps to security conglomerate has its humble origins. Ardeshir Godrej set up his padlock factory in one of its by-lanes to ensure safer homes in the vicinity in 1897. Godrej still owns large chunks of land in Lal Baug. Remember Red Garden? It was the home of the Wadias all lit up—the family were the first to illuminate their residence with gas from the Bombay Gas Co. Prior to this the gas was used only for cooking and lighting the street lamps by ‘illuminators’. The pipelines are currently used for fibre optic cables by telecom companies. 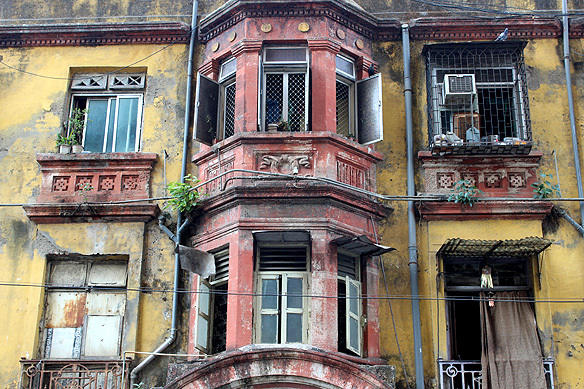 A remnant from Red Palace is Nowroz Baug, built by Bai Jerbai Nowrosjee Wadia (1852-1926), a philanthropist who built a series of five low-cost baugs or housing colonies comprising 1,500 apartments for lower- and middle-class Parsees. There are plans to pull Nowroz Baug and its grounds down, and replace it with four skyscrapers, each 40-storey high, by the current Wadia generation. May the best man/ woman/ Parsee win. Yes, you read the sub-heading right! The historically Hindu area of Lal Baug is named after a Muslim saint, Hazrat Lal Shah. 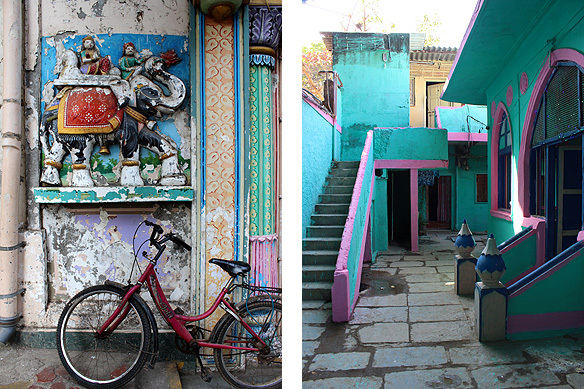 His neon pink and green dargah is said to be the oldest in Bombay, dating back to the 13th Century. It was renovated after the 1992-93 communal riots. Just around the corner is the dargah of his younger brother Chand Shah looked after by a Hindu Gaikwad family for generations. 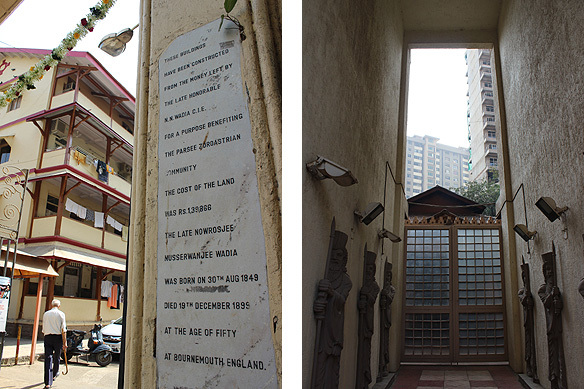 Standing in solidarity of Lal Baug’s secular identity are even more eclectically placed spaces of worship. There is a prettily decorated Jain derasar with an effigy of Shivaji Maharaj, a temple to Mhasoba, the buffalo-God, and an agiary squeezed into a renovated residential tower. But the bigger surprise comes when walking through a stream of chawls I end up in a verdant green 2-acre vegetable farm selling spinach, methi, lal math as if it is the most natural thing to be. The farm is owned by the Bombay Municipal Corporation (BMC) and has been farmed by the Gedia family for the past 90 years. I had to blink. Twice. To assure myself it was for real. The above are, may I point out, rarely a few hundred metres away from the main artery of Lal Baug, Dr. Baba Saheb Ambedkar Road, once upon a time Kingsway. 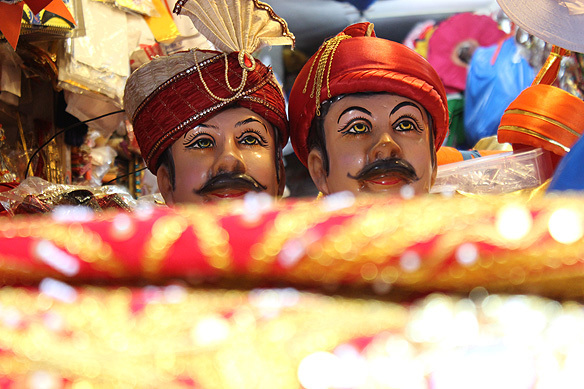 This street burgeons with shops selling all that is festive for it is on to this road that Lal Baug’s greatest, and most famous claim to fame leads into—Lalbaugcha Raja. 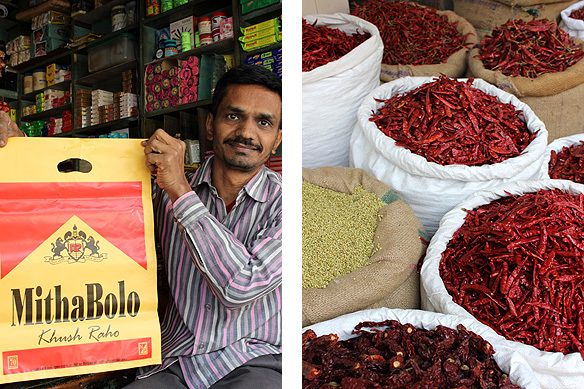 There are spice gallis [lanes] with endless versions of dried red chilli, a chivda galli devoted to Mumbai’s favorite snack, colors during Holi, diyas in Diwali, wedding paraphernalia. “Business is always good” here. Being non-ritualistic and relatively new to Bombay has in many ways led me to being unaware of the city’s indigenous festival side. Hence, when Bharat, our guide, went on about Ganpati celebrations, I was like “so what” until the enormity of its significance, in terms of Lal Baug specifically, hit me right in the eye. Everything in these side lanes revolves around this festival. There is the official route, the organiser’s offices, site demarcations; all unchanged since 1934. But, some context first. Ganesh Chaturthi is an 11-day Hindu festival in honor of the elephant-headed god, Ganesh, celebrated mainly in western and southern India around August or September. Two of the most famous Sarvajanik Ganpatis, clay idols for public worship during this festival in Bombay are in Lal Baug: Lalbaugcha Raja and Mumbaicha Raja, the latter a few years older and a couple of lanes away in Ganesh Galli. 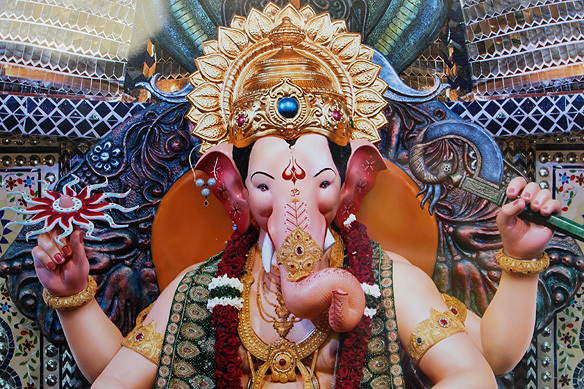 Followers claim the 20-feet high Lalbaugcha Raja, now in its 82nd year and sculpted by the Kambli family [local residents] for over eight decades, is Navsacha Ganpati—one who fulfils all wishes. Over 1.5 million people visit the Ganesh pandal daily during the festival. In 2015, a 620-foot set made entirely of Belgian glass was built around the idol. On the rest of the 354 days, a flat piece of stone is worshipped in Lalbaugcha Raja’s place. The story goes that in 1932, the market in Peru Chawl was forced to shut down. The fishermen and vendors prayed to Lord Ganesh for a permanent space where they could market their goods. Almost as if in answer to their prayers, the landlord Rajabai Tayyabali agreed to give them another plot. 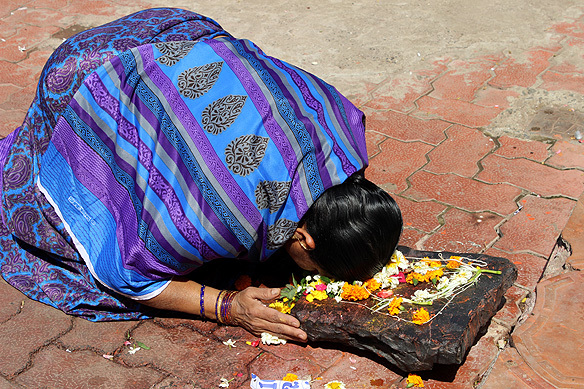 In gratitude, an idol of Ganesh was set up by them on 12 September 1934, dressed in the native attire of the Kolis. From that day onwards, the idol has been associated as one who fulfils all wishes. The #LalbaugStroll was run by Bharat and Zainab of Khaki Tours. 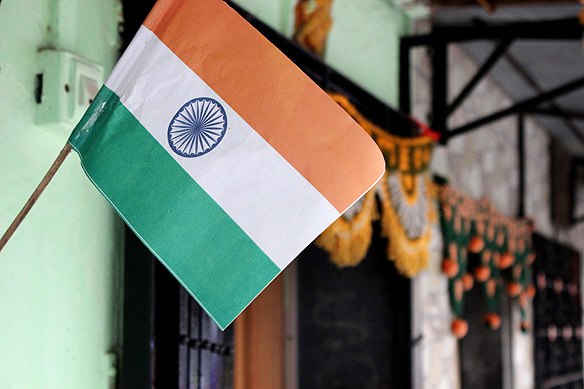 Funds raised from ticket sales were donated to Nanhi Kali, an NGO working on girl child education in India. This entry was posted in Bombay aka Mumbai and tagged Bai Jerbai Nowrosjee Wadia, Bombay Gas Co., Ganesh Chaturthi in Mumbai, Girangaon, Godrej Lock Factory, Hazrat Lal Shah, Heritage Walks, History of Textile Mills in Mumbai, Khaki Tours, Kingsway, Lal Baug, Lalbaugcha Raja, Mumbaicha Raja, Parsees in Mumbai, Things to see in Mumbai by Rama Arya. Bookmark the permalink. Glad you think so, Shrikant. 🙂 But then Lal Baug is a microcosm of Bombay in the most literal sense, don’t you agree? And Bombay or Mumbai has become a microcosm of India ! !